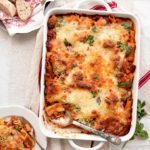 This baked rigatoni layered with herbed ricotta and meaty marinara sauce is a dinner casserole worthy of sharing! Baked rigatoni is one of those dishes I’ve been making forever. Back when Kevin and I were young and newly together, I had a number of pasta dishes in my repertoire I would make for friends. I should say, mostly his friends because I was somewhat transient at the time. College was a hurdle for me because I was trying to put myself through a musical theatre school by waiting tables nights and weekends. In the end, it didn’t work out and I ended up losing my pell grant by working too much. Let’s just say this was the blow of a lifetime. I had the talent to get into a conservatory but not the resources to stay. So, with my tail between my legs, I moved in with Kevin while he finished his theatre degree. But at least I got to live vicariously through him while I figured out my next steps. And luckily, his friends (and the Mary Washington theatre department) didn’t mind me tagging along. Because all of our friends were broke theatre students too (in other words hungry), pasta was an affordable choice . Kevin lived off campus so there was always room at the table and we welcomed the company. And frankly, I loved entertaining and cooking for a crowd. There is something magical that happens when a group of friends sit down to eat together. And it goes further than the laughter and full bellies. Sharing a meal can be very intimate. The closeness of the experience provides an opportunity for sharing personal stories and getting to know each other in a deeper, more meaningful way. Once I learned this truth, cooking became a tool to make friends. Sharing my love of food became a way to break the ice as we moved from place to place and job to job, easing the loneliness and making each new place feel like home. Now that we are settled down, I’m learning that simply sharing recipes can be a way to make new friends across the globe, whether it’s here on Vintage Kitty or in a facebook group. Food is a way to break down barriers and satisfy our need for community, but it’s also how we preserve memories and cement cultural traditions. What can I say? I’m a budding food anthropologist! And it’s my mission to make Vintage Kitty a place not just share recipes, but tell the stories behind them too! To this end, I’m starting a new series called #myvintagerecipe that will cover my favorite family recipes as well as explore food stories from my friends, family and readers. My hope is that these stories will help us better understand how the food we eat plays a vital role in our personal lives and tells a larger story about the cultural impacts of food within our communities. I’m hoping this new series will inspire readers to discover their food history and maybe even create some new traditions too! In the spirit of friendship I’m bringing you this baked rigatoni recipe as the very first #myvintagerecipe feature. 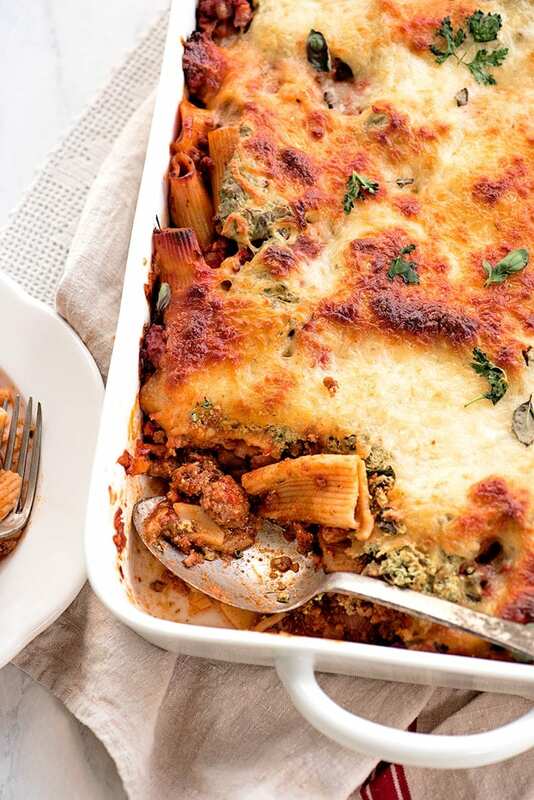 In ways, it’s a combination of the two dishes I’d make the most often back in the day… an herbed vegetarian lasagna and a sausage filled rigatoni bake. This cheesy rigatoni casserole is like a classic lasagne with less fuss. It has a hearty meat sauce made with ground beef, Italian sausage and a jarred marinara for ease. On top there’s herbed ricotta covered with mozzarella. It’s cheesy, meaty, saucy and so comforting! It’s really nothing fancy, but for me this dish reminds me of friends and those early days when Kevin and I were starting our life together. 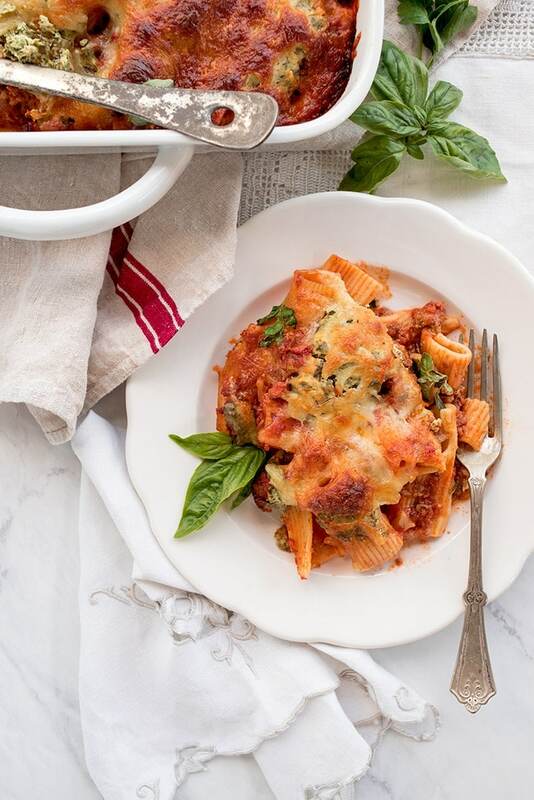 Our baked rigatoni serves a crowd so you can carry on the tradition of breaking bread with friends. The more the merrier, especially if you serve it with our Italian Power Salad and Fried Mozzarella Balls! Do you have a food story you’d like to share? Contact us! We’d love to hear from you! Fill a large pot with water, salt it generously and then bring it to a boil. Once boiling, add the rigatoni and cook to al dente (about 10-12 minutes) then drain thouroughly. Meanwhile, in a large Dutch oven, brown garlic and onion over medium high heat. Once the onions are golden, add the sausage and ground beef and break up large pieces with a wooden spoon. Cook meat until browned, then add marinara sauce and season with salt and pepper to taste. Place ricotta and egg in a food processor and pulse to combine. Add herbs to ricotta mixture and pulse until herbs are chopped then season with salt and pepper to taste. Lightly oil a lasagna pan, and layer the bottom of the pan with half of the sauce. Evenly distribute the rigatoni over the sauce. Spoon remaining sauce over rigatoni and then dollop the ricotta mixture on the pasta. Finally sprinkle the top of the casserole with mozzarella cheese. Bake uncovered 45-60 minutes, until cheese is golden and the sauce is bubbling. 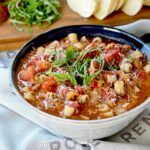 Pizza Soup is a hearty, robust tomato soup filled with Italian flavors and ingredients. It’s supremely delicious and can be served as an appetizer or as an entree with a side salad or grilled cheese sandwich. That golden cheesy top is calling my name! My family will love this dish. Isn’t the cheesy, cruchy, gooey top the best? I’m Italian and your delicious rigatoni (stunning photography btw!) bring me right back to Sicily! You just reminded me I need to make it more often, loved that you added ricotta cheese as well! Thanks Andrea! I’m glad I did it justice! 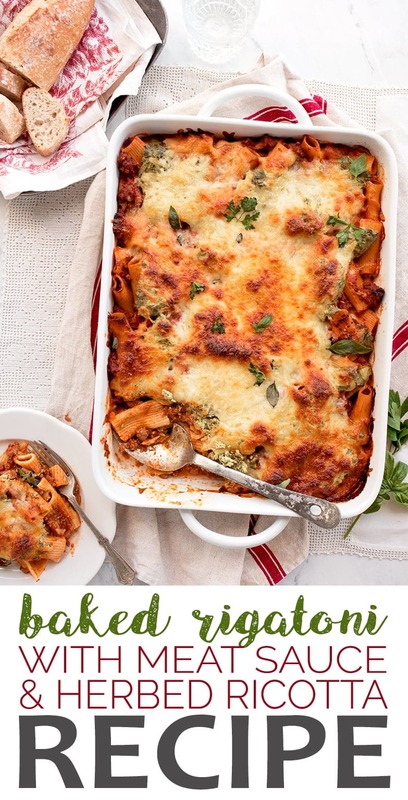 I used to eat baked pasta dishes like this all the time when I lived in a neighborhood with a great little local Italian American restaurant – so I never actually made any! Looking at this, I realize how much I miss that – and how much the family would enjoy it! Thanks! That sounds like a wonderful neighborhood! I love Italian food! 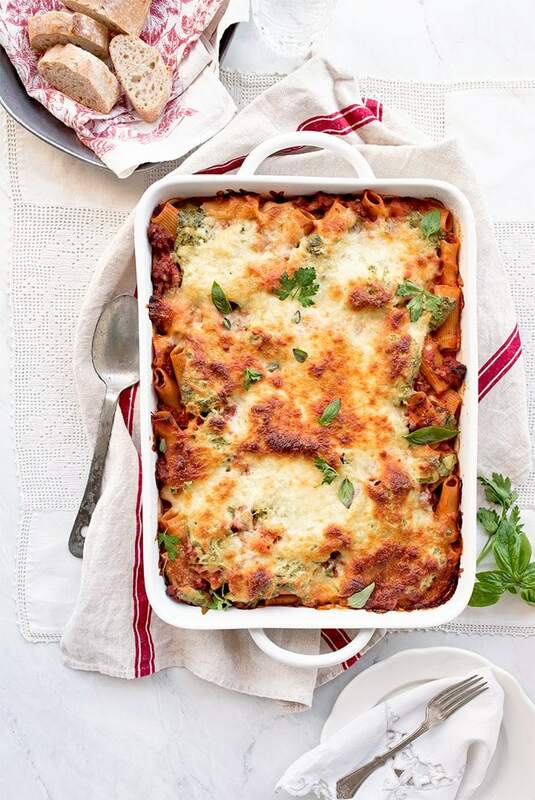 This baked rigatoni looks absolutely delicious. And it’s so easy to make! I also love your focus on keeping traditions alive. I learned to cook from my grandma, and making her recipes is a way to feel closer to her now that we live really far away. I used to bake with my grandmother so I know how special that experience was for you! Drooling over pics. Such a delicious dinner recipe. Can’t wait to try for my family. Hope the family loves it! Mmm, mmm! That looks like one hearty and delicious meal! That herbed ricotta layer sounds so good! Oh my it is! Think I need to make this one more time before before first frost. I’m going to be so sad when my herbs are frozen! Sharing food with friends is the best, we have started doing a theme night once a month where we pick a cuisine and everyone shows up with a dish to share. So fun. 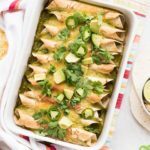 Loving how easy this is, and such a great option for feeding a crowd!! That sounds like a fun way to get together with friends! Time with friends is really important for our happiness. 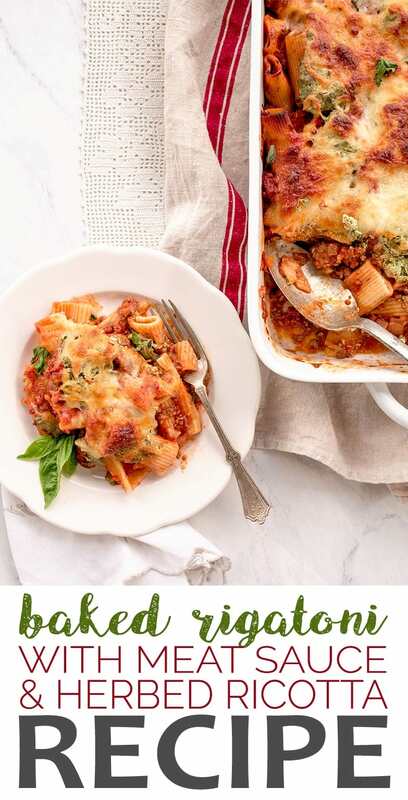 Baked pasta is my favourite.This recipe looks so tempting. Love the look and it looks delicious.Can’t wait to try this next. 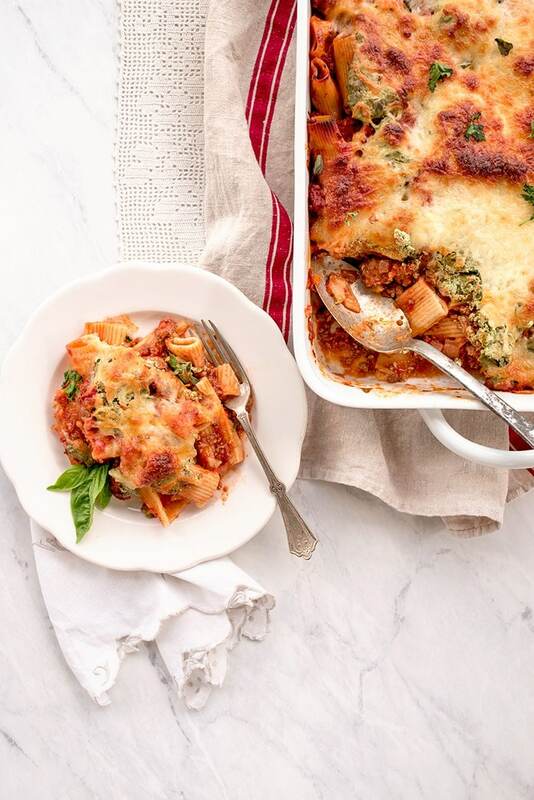 Can’t go wrong with baked pasta! This really is my kind of meal. I love a good, comforting pasta bake. Looks delicious. Thanks Emily. It is so comforting, especially now the weather is getting chilly. These look amazing! Super easy and the best kind of comfort food. Love the easy list of ingredients and what a perfect recipe to always have on hand. Thanks Heather I hope this becomes a staple recipe for my readers. 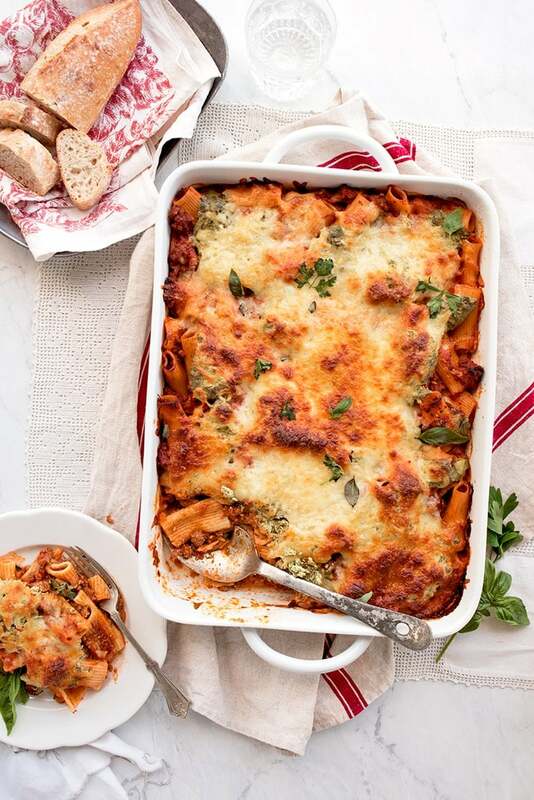 This baked rigatoni looks amazing! Nothing beats a nice bowl of pasta on a cold day. Pinning to try later! Seriously! It just suddenly got cold here after being in the 80s. Now I can’t think of eating cold food. Pass me some hot, steamy casserole please! This is absolutely delicious and your pictures are so beautiful! Thanks Courtney! So glad you loved the recipe! Wow – the flavor in this was amazing! So delicious! Thank you! You’re welcome Pam! Happy you loved it! This is absolutely perfect for a cold night – so comforting! This rigatoni is absolutely amazing! The cheesy baked top is irresistible! Isn’t it? Thanks for the recipe feedback! My family loves this! So delicious!